Impressions: The Seeker G870 is no ordinary saltwater rod. When you glance at the rod it looks like a robust fiberglass rod, but under closer inspection the underlying graphite wrap is unmistakable. This rod is in fact a unique combination of both fiberglass and graphite. The rod is predominately black in color, with both blue and gold threading highlights. Overall the rod is alluring in design. One nice detail Seeker incorporates on the rod is a depiction of a species actually placed on the blank, highlighting the particular fish the rod is intended for, our G870 sported the portrait of a Halibut. 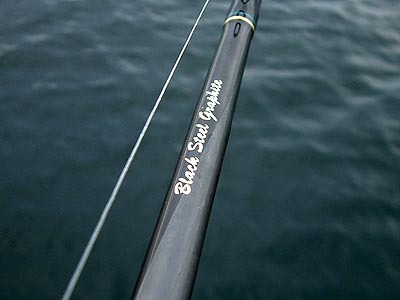 The Technology behind Black Steel: Graphite rods have less flex than pure fiberglass rods, and for this reason have often been frowned upon for heavy saltwater use. When graphite rods reach their maximum flex point the graphite fibers actually fold over, actually snapping, or as described by many anglers in the field as �exploding.� But graphite offers many advantages and can generate action that fiberglass simply cannot. Seeker sought to integrate the benefits of both materials together in what they have dubbed�Black Steel. Seeker�s composite manufacturing technique uses a amalgamation of graphite and even multiple types of fiberglass. 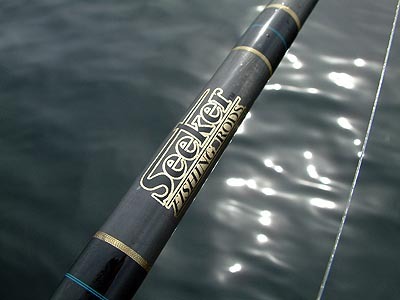 Seeker�s E-Glass is laid in one direction while the graphite is laid in another, producing a counter action that prevents the rod fibers from buckling over. This results in a rod that offers the durability of Fiberglass, and the accurate feel of a graphite rod. Field Tests: The best way to test the Black Steel 870 was to pit the rod against Halibut, Sturgeon, and King Salmon. Our test rod endured a full season of fishing. Since we fished the G870 for such a variation of species we coupled the rod up with one of our most vigorous reels, the Daiwa Saltiga. Casting: Seeker E-Glass is considered quite soft and even when paired with graphite the G870 is still a pretty flexible rod. 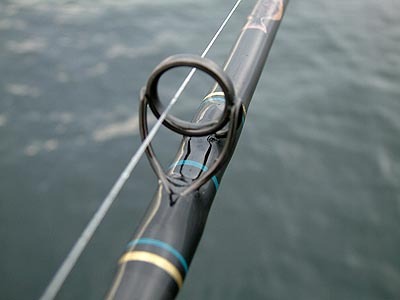 The good news is the rod flexes at all the right points and doesn�t feel stressed even when chucking heavy metal. Of course this rod was designed for deepwater fishing more than continually casting jigs and plugs, but just because the rod wasn�t designed for it doesn�t mean it can�t be done. The Black Steel is just stiff enough to allow anglers the flexibility of using the rod for limited lure tossing, rather than just live bait duty. The G870 uses a genuine Fuji graphite reel seat and a set of perfection tip carbide guides. 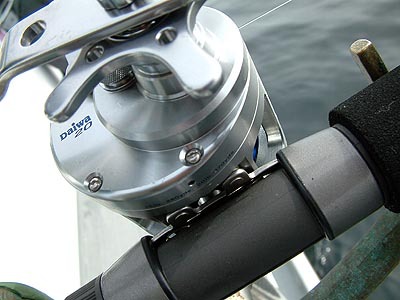 When paired with our Daiwa Saltiga test reel the seat provided a solid grip, but when fishing anything larger than Kings we still recommend using a reel clamp for added security. Sensitivity: The blended blank exhibited sensitivity characteristics similar to fiberglass rods. While subtle strikes and taps were transferred through the entire blank, the rod couldn't compare to pure graphite rods in terms of being able to genuinely feel ticks a hundred feet down. When compared to our fiberglass Fenwick Pacific Supreme test rods the Seeker Black Gold was slightly better, but exhibited a similar personality when it came time to dragging baits on the ocean floor. During our Halibut tests we moved swimbaits across the ocean floor. With graphite rods we could easily distinguish the sandy versus rocky bottoms, and react to strikes quickly. With the Seeker it unquestionably took a lot more concentration, and we often reacted excessively when the swimbait came in contact with structure, as it was much more challenging to discern when the bait was actually being taken. Retrieve/Power: Graphite delivers more lifting power than fiberglass, and the Black Steel mix delivers the goods when it comes to sheer muscle. When fishing for Sturgeon and Salmon the G870 had plenty of strength to turn and lift these species without ever feeling stressed. The one nice thing about Black Steel is that it recoils much faster than pure fiberglass and while not as fast as pure graphite rods, it didn�t feel sloppy at all. As the rod arches, and you pump your rig higher the rod reassures you with it's brawny backbone. 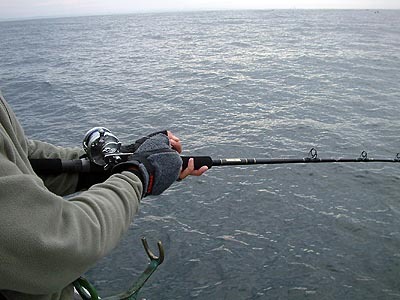 You don't need to worry about snapping this rod via overloading, it can take a profusion of stress...and then some. Comfort: The G870 is a mid weighted rod, and while not overly hefty, is certainly heavier than pure graphite stand up rods. Anglers used to fishing pure fiberglass rods will instantly relate to the G870�s overall size and mass. Seeker offers the Black Steel in a variety of different grips, but the choice of standard hypalon grips for the G870 was a agreeable selection. 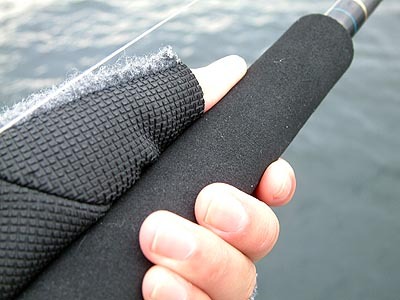 The rod grip is easy to maintain a solid grasp on even when wet, or wearing gloves, and is a true blessing when it comes time to hosing off scales. Durability: We have fished the Seeker G870 hard over the last eight months, and the rod has been able to take everything we threw at it. There is a generous amount of epoxy resin and a flex gloss coat over the entire blank surface, and this layer helps shield the rod from potentially harmful nicks and scratches. From jigging and live lining over 100 feet down, or mooching for Kings, and even baiting Sturgeon, the Rod hasn�t shown any signs of injury. The Black Steel series of rods feature attributes that make it a very attractive choice for big fish like Tuna, since you can basically pump and high stick this rod without risk of overloading. Seeker stands behind their product and all Black Steel rods come with a Limited Lifetime Guarantee. Conclusion: Seeker's unique blend of fiberglass and graphite are a successful attempt at improving saltwater rods. Anglers that shy away from graphite rods due to fear of "blowing" them up will find the Black Steel rods offer the same level of durability they expect from glass, with some of the refinement that only graphite can deliver. 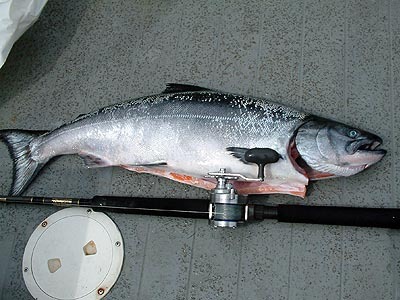 The G870 is a multi-talented rod that can be used to fish an assortment of species, and while it may not be ideal for anglers who necessitate acute sensitivity from their rods, it will supply the sway necessary to horse immense fish from profound depths.